President Barack Obama and Vice President Joe Biden are not new to the meme scene. For months now, social media users have been sharing photos of the two leaders and friends, captioned with imaginary and hilarious conversations. Biden, America’s “Uncle-in-Chief,” is usually positioned as the jokester prodding the responsible and exasperated Obama. But in a post-election world filled with anxiety for many Americans, the memes have taken on a whole new life. Now, they focus on Biden trying to prank an incoming President-elect Donald Trump and his staff. The results offer some comic relief after a tense and vitriolic campaign season. 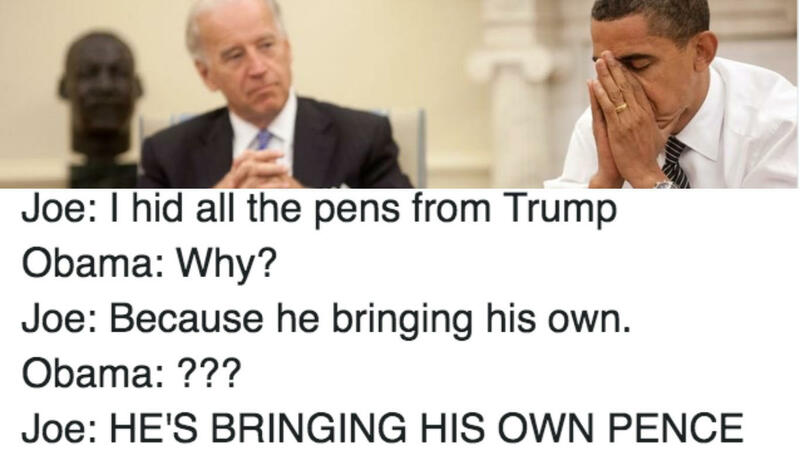 Below, behold a hilarious glimpse into the secret world of Obama and Biden, as imagined by internet users.